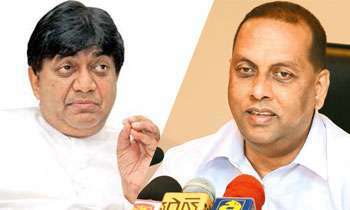 If the Cabinet consists of four agents of the Indian spy agency RAW, what UPFA General Secretary and Minister Mahinda Amaraweera should do is to expose them and quit the government immediately, SLFP dissident Dilan Perera said yesterday. He said he could not understand why 23 SLFP members were still in the government even after the media exposed an alleged plot to assassinate President Maithripala Sirisena and former defense secretary Gotabaya Rajapaksa. He said it was time for all the SLFPers to quit the government and unite all anti-UNP forces to form a government with Mahinda Rajapaksa as the prime minister. “We are canvassing for a caretaker government and not for an interim government to replace the yahapalana government. I can’t think of a better opportunity to topple this government and form our own government. All progressive forces who are against the policies of this government must unite under Mr. Rajapaksa and form a government soon,” the MP said. Commenting on the remarks made by the President at the F.R.Senanayaka memorial ceremony, he said all what he said was correct. “DS and Dudley set up farmer colonies and resettled landless people there. We reap the benefits of these policies today. Unfortunately what Ranil is doing now is selling lands and national assets to foreigners. That is the difference between UNP under Senanayakas and Wickremesinghes,” the MP said. He said bankrupt politicians like Sarath Fonseka had undertaken the hatchet job on behalf of Ranil and was attacking the President. MP Thilanga Sumathipala said requesting India’s assistance to probe Sri Lanka Cricket (SLC) was an insult to SLC. Why should he QUIT . Just because you bunch of JOkers DIDNT win in the last general elections doesnt mean others should RESIGN . Both are A grade rouges. why should anybody resign after telling the truth? Has Dilan gone off his head? In any case in SL, there is no word as "resign" applicable to Parliamentarians. This is election propaganda. MARA says cant be so but when he lost he said it was the work done by neighbors. Hon. MP, are forgot how to you have been selected as MP. Keep be silent your mouth at least now ? Minister Ameraweera is a hard working person unlike Dilan who is bankrupt. Come in the proper way. Democratically voted!!!!! Ha ha ha !!!! Try if you can win or elected by VOTE. Joint jokers. Dilan is now good only for the Municipal Dumpster. You mean PUMPKIN municipal dumpster.